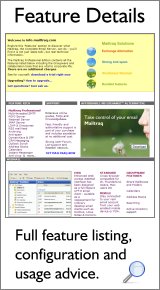 Mailtraq installs with ease onto Server or desktop editions of Windows. An installation wizard takes you through the install process and in a few minutes you will be up and running. If you are new to running a mailserver there is a Guide to assist you. The trial version also has an on-screen help-sheet (see here) to assist you with additional configuration, and when you are ready to buy there is no reconfiguration required when you move to your permanent license. There is an extensive Knowledgebase with articles on all aspects of managing Mailtraq, an essential FAQ page to help with any initial questions you may have and detailed feature by feature data-sheets right here on the website. Mailtraq Professional is a fully standards compliant mail server, designed to be the primary mail server for your domain/s. SMTP, POP3 and IMAP provide full mail services. A full function web-server (there no need for IIS™) provides a complete WebMail system for all your local and remote users, and hosts your websites. DomainKeys, SPF, and SMTP-connection controls to block Spammers. Anti-virus integration with leading professional-grade A-V engines.